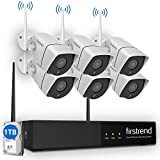 WIRELESS SECURITY CAMERA SYSTEM: 24/7 surveillance system comes with 1080P NVR, 6pcs of 1MP wireless security camera at IP66 waterproof and a pre-installed 1TB HDD. It's equipped with multiple features such as night vision(up to 65ft), live-streaming, remote monitoring and motion detection alerts..
PLUG AND PLAY CAMERA SYSTEM: Featuring Auto-Pair technology, plug the camera and NVR power supply into outlet nearby, connecting NVR box to a monitor, you'll get a sharp and crisp image day or night smoothly. 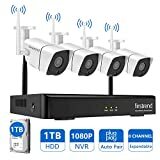 NOTICE: Wireless means video cable is not required for cameras' working, but device user still NEED to connect camera to Power outlet for 24/7 surveillance purpose..
VIDEO SECURITY CAMERA SYSTEM: Record, playback and store footage directly to your NVR with 1TB Hard Drive pre-installed. 24-hour daily recording as the factory default setting, device user can also customize your own recording schedule. With Firstrend Home Security Camera System, you won't miss your important moment.. REMOTE HOME MONITORING SYSTEMS: Free APP can be download to remote view and playback recordings (Please make sure NVR is connected to your router by Ethernet cable). It also support Sync-playback,Video Backup and Motion detection Alert. Email alert or App alert will be sent once motion got triggered (Noted: Please Set it Up Properly to Avoid Email Blast)..
FAQ(Frequently Asked Question) of Firstrend Wireless Security System Q: What's your Warranty information and how to contact you? A: 60-day Free Return, 12-month Warranty Service. Both Email and Phone Support are available. Because of time difference and busy hotline, we may miss your call. Please don't worry, we'll call you back for sure. Or email us [email protected], we'll respond ASAP. Q: What's the log-in password? A: There's no log-in password as the Default Setting. Leave it back and simply click 'OK' to next page. Q: How to create a password for my NVR System? What should I do when I forget my system password? A: After logging in--go to System setup--System admin--User-- Set Password Please keep your password in your mind, or it requires more effort to get it back. Please understand. If you forgot it, please email us your Phone Number, so that we'll call you back and help you out. Q: What's the working temperature of Firstrend Security Camera? A: Camera working temperature: From -50 degree Fahrenheit to +122 degree Fahrenheit. Q: How to turn on Continuous Recordings (24 Hours, 7 Days)? A: On your monitor, right click your mouse, choose Manual Record in Menu page, select All, click 'OK'. Q: Where should i playback recordings? A: Please right click the mouse--go to 'Video Playback'. On Playback page, please select Date first on Calender, then, click 'Search' button. You'll see Color Timeline at bottom of the page, such as Green Bars means motion detection recordings, Red color means Normal Recordings. Double-click the color bars, it stats to playback automatically. 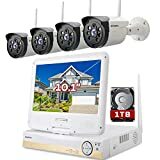 WIRELESS SECURITY CAMERA SYSTEM: 24/7 surveillance system comes with 1080P NVR, 4pcs of 1MP wireless security camera at IP66 waterproof and a pre-installed 1TB HDD. 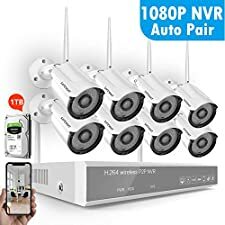 It's equipped with multiple features such as night vision(up to 65ft), live-streaming, remote monitoring and motion detection alerts..
Limited Time SALE! Back to $299.99 in 12:00AM.【All-in-one Solution, Plug n Play】built-in 10.1" monitor, it is a complete remote monitoring system with everything you need..
【Auto-Pair Wireless, No Need to Run Video Cables】but cameras are not battery powered, they must be plugged into a power source..
【1024GB Hard Drive Pre-installed for Recording】the nvr will do around 18 days of continuous recording, record 30+ days under motion detection..
【1280*720P HD Video, 80ft Night Vision, IP66 Waterproof】the durable aluminum housing built for indoor or outdoor use..
【24/7 Professional Technical Support and 1 Year Warranty】EMAIL SUPPORT- reply within 8 hours; LIVE CHAT SUPPORT at our official website: 6:00PM - 12:00AM, PDT Time; PHONE SUPPORT-email us with your amazon order #, phone number & time zone, we will call you back! 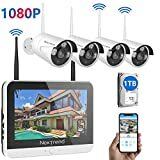 Provide free brand-new parts for replacement..
[ALL IN 1 HOME SECURITY CAMERA SYSTEM]: NexTrend 1080P Wireless Security Camerea System Built-in 12" HD Monitor (not touch screen), 1TB Hard Drive Pre-installed. 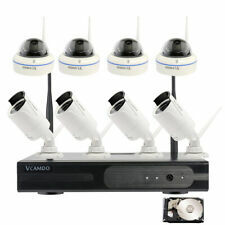 With 4pcs IP Security Camera, Night Vision up to 65ft, Suitebale for Outdoor Surveillance Security. Auto Paird with NVR, True Plug-Play, Save Your Time and Cost from Find External Monitor or Hard Drive. [RELIABLE & FASTER VIDEO TRANSFER]: Home Security Camera System Comes with Advanced Video Compression Technology, Brings You Ultra HD Image Quality with 40%-50% Hard Drive Storage Saved. Double The Recording Time, Reduce Bandwidth by Maximum 50% of Conventional H.264 Compression, Enable System Work Flawlessly Carry 1080P FHD Streams. 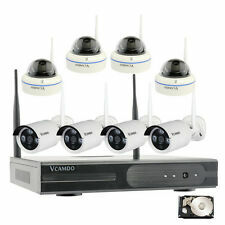 [24/7 SURVEILLANCE SECURITY]: Expandable Security Camera System Max Support 8Pcs Security Camera. With Stable Power Supply(Not Battey Powered), Provide 24/7 Security, Always Prepared. Video Stored to Hard Drive Directly, no Monthly Fee. When HDD is Full, New Recordings Will Automatically Overwrite the Prior Recording. 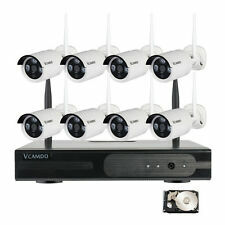 [REMOTE ACCESS]: Home Security Camera System Can Working Without Internet. (Need Connect To Power Outlet All The Time) Without Internet, You Can Got Live Video, Video Record, Playback, Backup in Local Monitor. With Internet (Connect NVR to Your Router), You are Able to Use Your Mobile Phone/PC Remote Access NVR System Anywhere Any Time..
[CUSTOMER SERVICE]: Wireless Security Camera System is NOT BATTERY POWERED. Local View No Need Internet. All of Our Products With 1 Year Warranty And Lifetime Technical Support. 60 Days Money Back. Any Questions, Please Feel Free to Contact Our Customer Suppport at [email protected], Or 1-888-996-8783(Available after 5:00 PM at Pacific Time).